Thank you Isaac for your kind testimonial, and we wish you all the best in your trading! Would you Like to Start Learning Real Skills & Getting Real Results? You can join us and start anytime, as the training is ongoing every month via our training workshops. You can refer to the training schedule below. https://i2.wp.com/synapsetrading.com/wp-content/uploads/2012/11/2016-03-07-14.57.54.jpg?fit=2448%2C3264 3264 2448 Spencer Li http://synapsetrading.com/wp-content/uploads/2014/03/logo-header1.png Spencer Li2016-05-04 08:00:132016-03-23 00:23:32Testimonials: "Great Course, it Sheds New Light on Existing Concepts"
Testimonials: “Wonderful Course, Highly Recommended"
Testimonials: “Patient and Willing to Share His Knowledge"
Testimonials: “Excellent Course Materials. 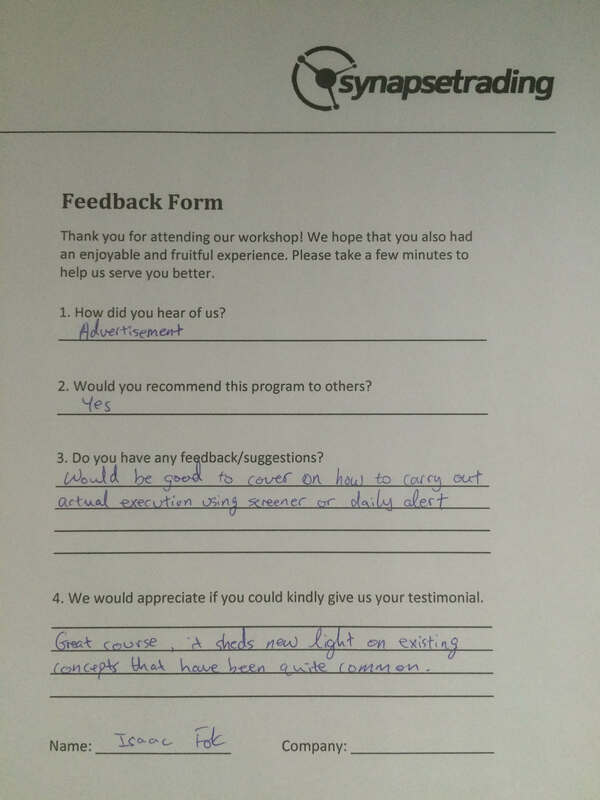 Well-Delivered Training"
Testimonial: "Willing to Share his Depth of Learnings and Insights through his Reading and Experience"
Travel Highlights: Dubai, South Africa, Lesotho - Over 3,000km by Road! Price Action + News Trading: 297 Pips Profits on USD/JPY in Record Time! Shorting the S&P 500 – Potential Trade of the Year?